With the heart and mind full of love and devotion, recite the name of Lord Rama. Reciting the name of Lord Rama cuts down sins and miseries and helps to cross the ocean of life and death. So potent is Lord Rama's name that it brings eternal peace and bliss and is the only support of those who have no support. 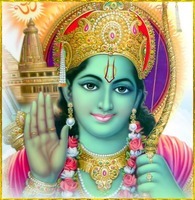 So loving and so divine is Lord Rama's name that sages and saints always have only Lord Rama's name in their hearts. Lord Shiva always chants the holy divine name of Rama. For those who are dying in the Holy city of Kashi Lord Shiva gives liberation by chanting the holy name of Ram in their ears. Thou art my Mother, Father, Relations, Friends, everything, and all. The only life-long treasure of the devotee is Thy name. Chant the mantra 'Rama Rama Ram'.